During the first years of the university I used to frequent a pub in Siena, where Saturday after Saturday I started to feel welcome and at home. The tables bore carved in the wood the marks of the endless chats with my friend Laura, conspiratorial words whispered in a low voice in front of a bowl of chips with ketchup, mayonnaise and spicy tomato sauce. That’s where I drank my first beer, at the ripe age of 22 years old… you know, I’m a soft drink girl! Every time we indulged in the entranced reading of the menu as if it were a Michelin starred restaurant, evaluating with interest pairings and news: tacos, flat bread with Nutella, bruschetta, wraps… The strong point of the pub were the panini, though, hot and cold, 18 for each category. When I was unsure about what to order, I went on with my favourite one: a hot 16 and a lager beer, a small one or I won’t be able to drink it all! The 16 was the panino I used to choose when I wanted to be reassured, when I could not lose myself in the contemplation of the menu because I was telling Laura word-for-word the developments of one of the many unrequited loves, which needed to be analysed in great detail from every point of view. The 16 was the panino with artichoke sauce, smoked cheese and cured ham: it’s a combination that worked so well with the lager beer that I turned all the ingredients into a winter risotto, which still has the taste of those long Saturday nights of chats and great expectations. Keep the vegetable broth simmering gently over low heat. Melt the butter in a non-stick pan over medium heat, then add the thinly sliced onion and a crushed clove of garlic. Sauté the onion for 5 minutes, stirring often with a wooden spoon, until it becomes transparent, then remove the clove of garlic that has already infused the butter with its flavour and add the artichokes. Cook them over medium heat for 5 minutes. When the artichokes begin to soften, pour the rice into the pot and lightly toast it, stirring constantly with a wooden spoon. When the rice grains become pearly white and you begin to feel like a soft crackling sound coming from the pot, pour in a glass of beer and keep on stirring with the wooden spoon. Once the beer has evaporated completely, add a ladle of simmering broth; stir in the next before all the liquid is absorbed and keep on adding the broth and stirring until the rice barely reaches the al dente stage - you'd need approximately 25 minutes, but it will depend on the rice you chose. Stirring the risotto frequently with energy and a wooden spoon will help to release the rice starch and it will make the risotto creamy without adding additional fat. When the rice is al dente, crumble the goat cheese over the risotto and stir in two tablespoons of grated Parmesan cheese. Season with salt to taste. Just before serving the risotto cut the cured ham into thin slices and use it to decorate each dish. What made this risotto so special? # spalla cruda, that is cured pork meat from the shoulder of the animal instead of the leg, from which you make ham, a traditional Tuscan product, tasty, perfect accompaniment for our Tuscan bread without salt, with an aromatic and tasty fat that goes well with the savoury and dry meat. # organic smoked goat cheese, brought here in Tuscany by Zita, a much appreciated gift from Hungary. I can already foresee that finding that smoked goat cheese in Rome is going to be somewhat of a challenge. I don’t even know if I’d be able to find it here! What structure does it have? I was wondering if one could smoke a goat cheese (or add smoked salt instead of normal sea salt) but whether it is fresh or cured (or semi cured – my guess here) is important. If you would like I can send you one piece of goat cheese from Hungary. The only problem is that you have to wait. 🙂 The cheese is produced by a small family farm and at winter time they don’t produce cheese. The baby goats have to be fed with their mums’ milk so there is no surplus milk left to make cheese. I would not want to disturb you to that extent (also, the postal service in Italy is a tad unreliable so risking fresh food in it is potentially dangerous). I am interested in knowing the structure of the cheese (i.e. how fresh it is – or not) to see if I can somehow replicate (or attempt to) the dish by smoking an italian goat cheese or just using smoked salt in the recipe intead. Thank for dropping by my blog. If you want, I can send you a piece of goat cheese by post. The only problem is that you have to wait! 🙂 The cheese is being produced by a small family farm and at winter time the baby goats have to be fed with their mums’ milk so this way there is no surplus milk left to make cheese. hehe, so many stories to tell from the university times! I think I’ll look back again, just to make a laugh! Thank you! What an original and interesting combination! That risotto must be very tasty. It is! Thank you Rosa! This looks like such a great idea! I’m going to propose it as a possible lunch dish this weekend. My old hauts at university were cafés that served huge cups of organic coffee and homemade pastries and sandwhiches. So many great memories of the hours I spent there with friends or my books! That would be cool, let me know what you think of the risotto! How I would have loved to spend some time with a huge cup of organic coffee and a large slice of carrot cake! This is really interesting, I have never actually put beer in my risotto. Definitely have to give it a try, looks irresistible! try it with different vegetables and beers! Wow. I am stunned! Risotto is one of my favorite dishes ever, and being German, beer is always good. I looove artichokes, and I have never put the three together. This is both intriguing and incredibly delicious looking! with all the excellent beers you have I’m really confident you’ll create great dishes! Let me know your experiments! Fantastique! I’ve never been a beer drinker–and believe me I tried at University 🙂 but, I adore baking, cooking & saucing with it. Our home’s all time favourite and oft requested chocolate cake is one where my key ingredient is Guinness beer–in fact, Le Mr has given up drinking it so that it’s only available for cake! 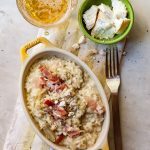 A winter staple in our home is my low-fat (not low flavour) cheddar beer cheese soup….but this looks like it is definitely going to get a try, though I’m thinking the French lardons will have to substitute for the ham…Thanks for posting! you intrigued me with your ideas! Actually a cake with beer is on my list as next beer – based recipe. As regard the soup, I am really curious about it, do you have a recipe or link to share? Lardons would turn great in risotto! Thank you Ravi for your appreciation! 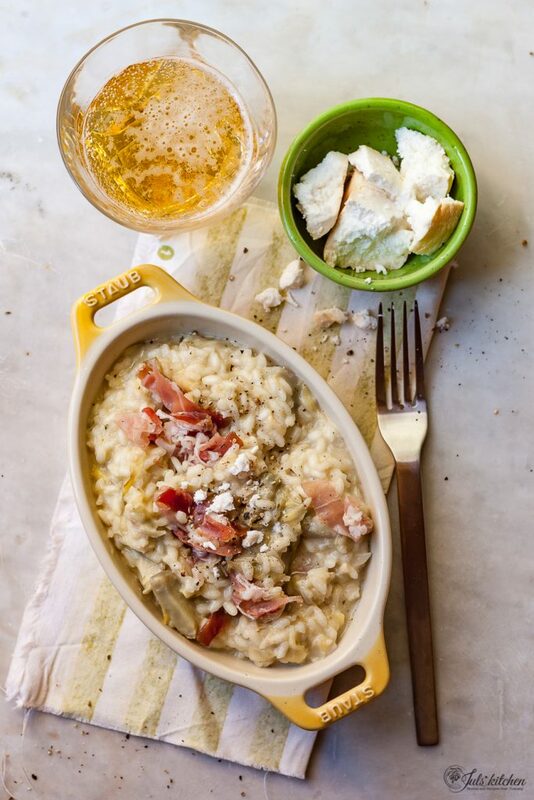 Risotto is one of my stable dish – especially pumpkin risotto – but since I discovered how good beer is in risotto I’m eager to try new pairings! This looks delicious. Would love for you to come and share this with us over at foodepix.com. This is lovely. I like to cook with beer but I’ve never tried it in a risotto. I do think so many of our most potent food memories come from the college years, I think because it’s the first time we really begin to choose for ourselves what and how we will eat. Love your blog. You are completely right Sue, it’s because we started choosing for ourselves, going out and having fun! Since you love cooking with beer, which is your favourite recipe with beer? I want to bake something! Never made risotto with this combo but it does look and sound fantastic! Nicely done!!! Congrats on the Fbuzz top 9! Thank you Sandra! it was a superb panino, now it’s a yummy risotto! Thank you Sarah, actually it was challenging, and I wasn’t completely satisfied with the final result, but the risotto was so good I wanted to share it with you all! I just made this!! tastes delicious! such a good combination of flavours. Definitely a treat on a cold friday night with a glass of red!